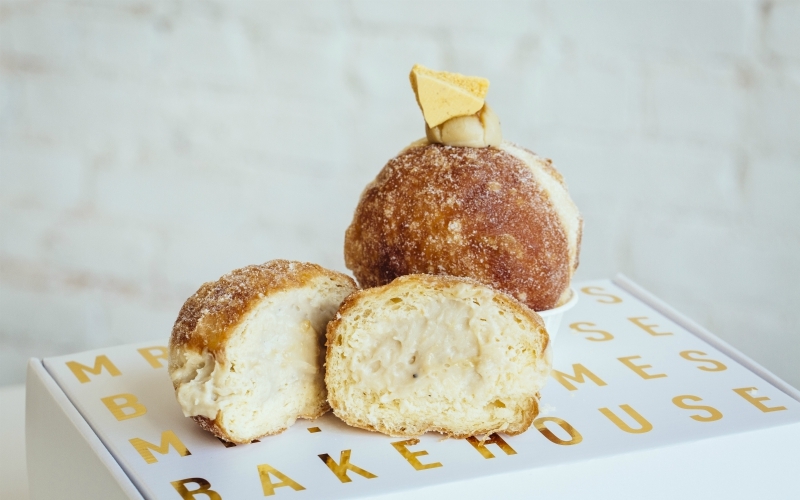 The long lines have died down, but Mr. Holmes Bakehouse is still serving up some of the most flavorful and inventive pastries in town. Their first L.A. outpost opened in Highland Park in 2016, and now there’s a second location on Larchmont and one in Seoul, South Korea, in addition to the original location in San Francisco. There’s always something fun and new to try, as their cruffin (aka, a croissant-muffin hybrid) and doughnut menu rotates daily. They just debuted their new seasonal menu this month, and we tried their new pastries, along with a couple of old favorites. Here’s how they stacked up. This croissant is explicitly lemon forward. It’s rolled in lemon sugar, filled with lemon curd, and topped with torched meringue, dried meringue shards with lemon zest, and broken pie pieces covered in white chocolate and lemon zest. We found the lemon flavor to be a bit excessive, but we all know that person who loves lemon-flavored anything and would die for this croissant. Matcha is super hot right now, and this is one of their most popular croissant flavors. 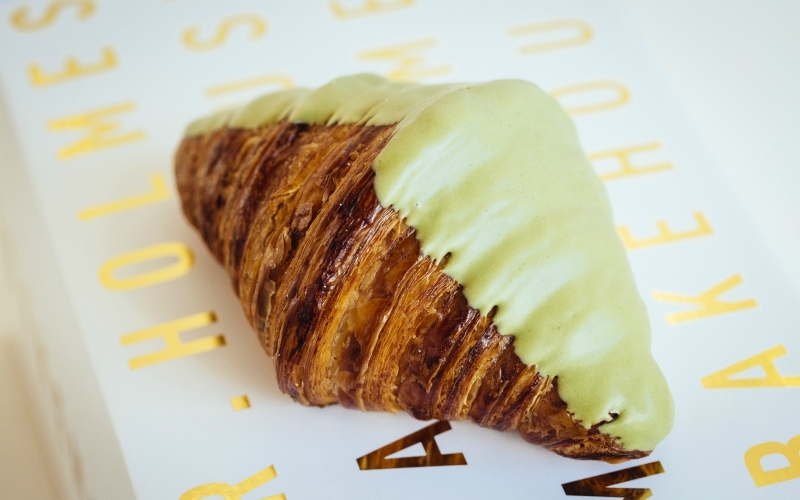 The butter croissant is half covered in a matcha-white-chocolate coating. Though the matcha flavor is nice and the croissant itself is flawless, there are more exciting flavors on the menu to try. 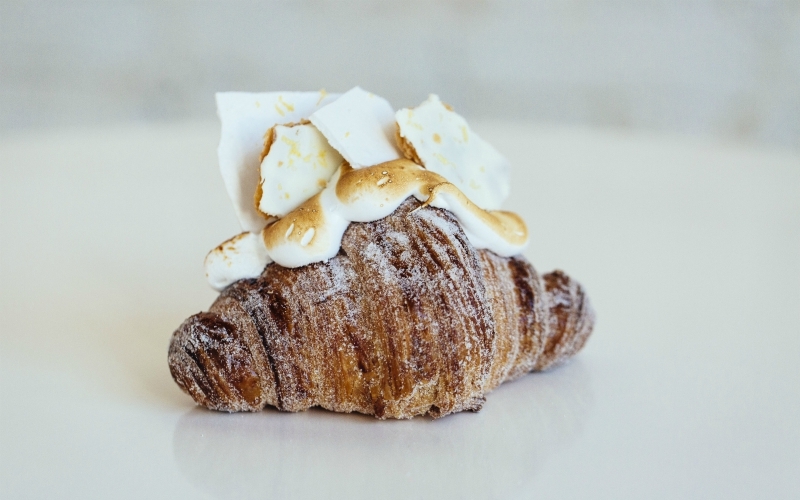 Their signature pastry, the cruffin, is more croissant than muffin, and it’s filled with a different flavored cream each day. This one has a bright and fruity filling that’s sweet but light. 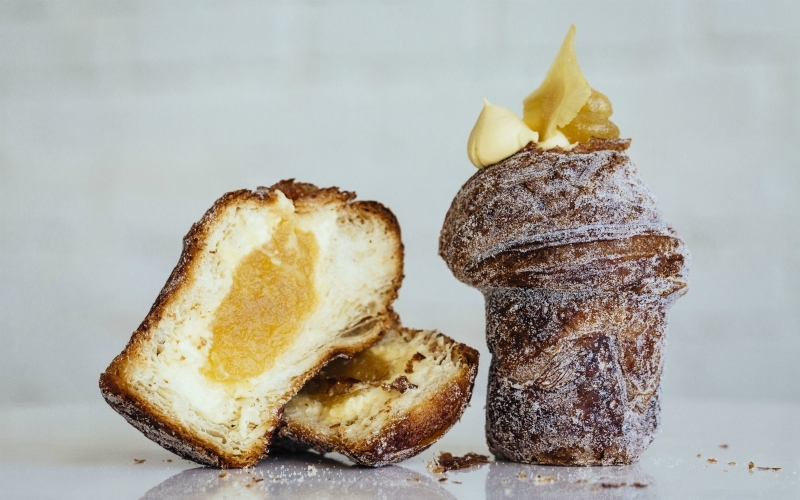 The best part of this cruffin is the pineapple leather garnish on top. It’s made from the core of the pineapple. (Yay, no waste!) They need to package these and sell them at the register. 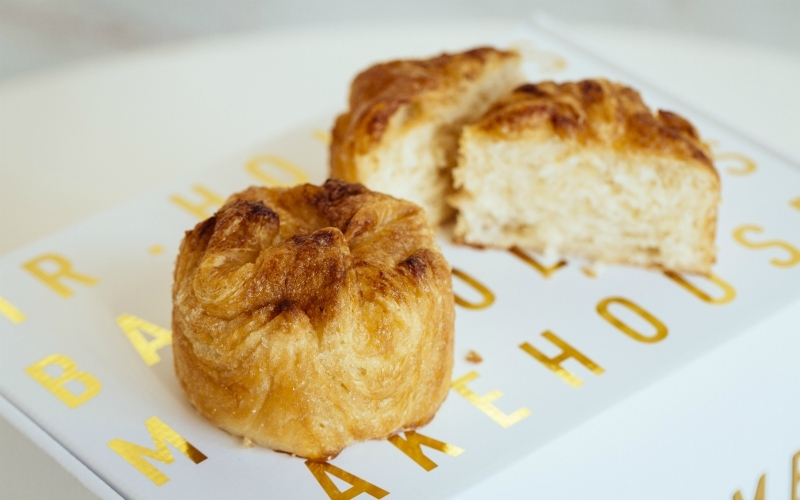 The kouign amann is sort of like a croissant, but the dough is folded inward, and the layers are more densely packed. It has the same buttery delicious flavor of the plain croissant, but it doesn’t leave you with flakes all over your lap. Since Earl Grey has become a new standard flavor in L.A., it’s no surprise that Mr. Holmes would have something on their menu that follows suit. What is surprising is how subtle the flavor is—and that’s a good thing. There’s no need to cover up the taste of these delightfully puffy donuts (which come in a different flavor everyday). The Earl Grey and honey cream is heavenly, and the light texture goes great with the airiness of the donuts. This is one was created in collaboration with Tinfoil, the liquor and sandwich shop next door to Mr. Holmes. It’s about time these two powerhouses worked together, and it was definitely worth the wait. This has house-made pastrami, pickled onions, pickled oranges, Manchego cheese, and it’s topped with pumpkin and fennel seeds. 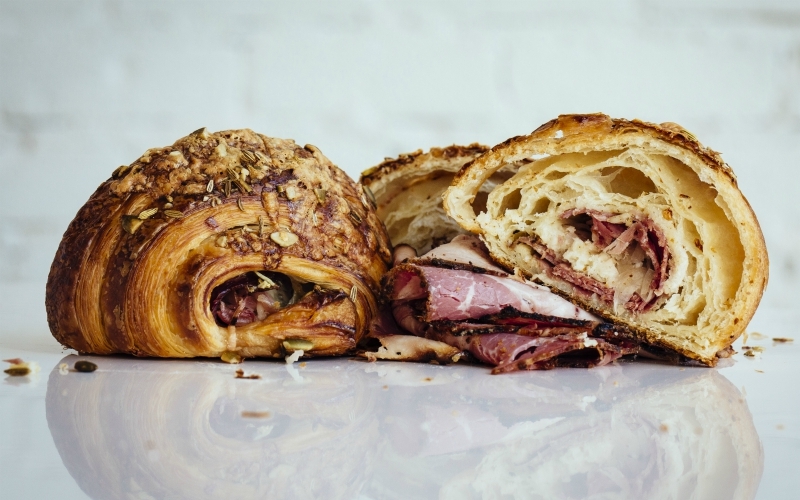 The pickled flavors brightens up the rich, peppery pastrami, and the croissant has a nice cheesy and herby flavor. 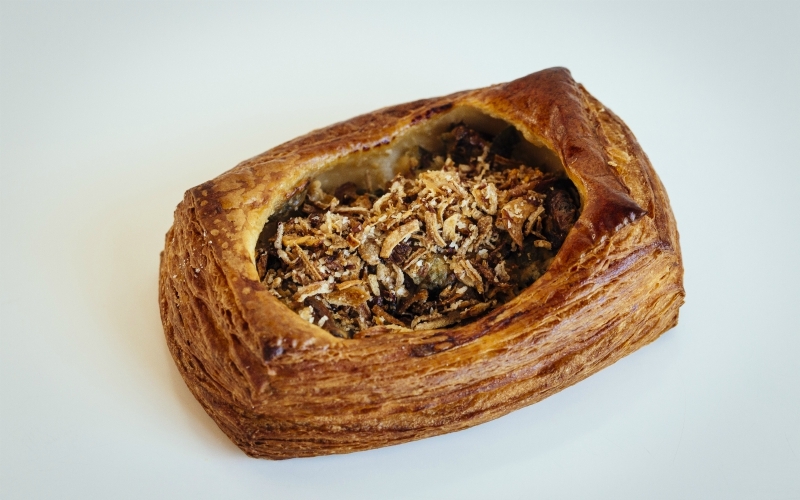 There’s one other savory pastry on the menu and it’s full of bold flavors. It’s made with sautéed shiitakes, sour cream, spring onions, and garlic. All the ingredients give this danish that mouthwatering umami flavor. The earthy shiitake mushrooms, the salty gorgonzola cheese, and the crispy garlic and onions are totally irresistible. This one ranks high on this list not just because the flavor is divine, but also because of the beautifully varied textures. 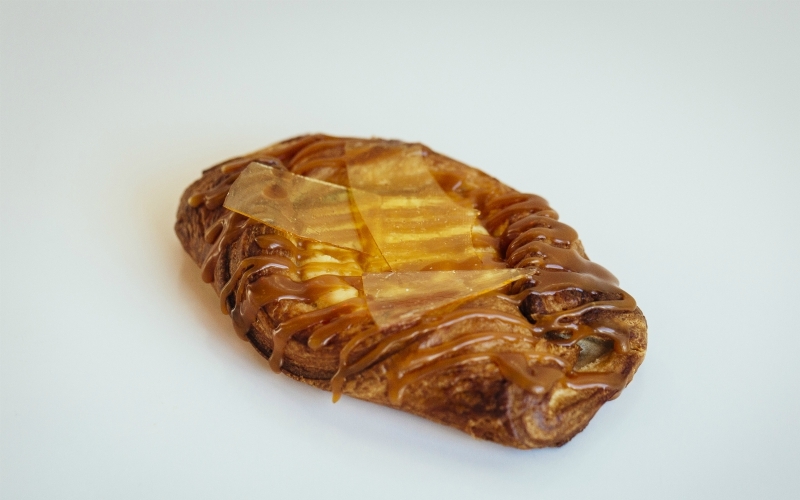 There’s the airy, flakey pastry, a thick and creamy cheesecake filling, a sticky salted caramel drizzle, and crunchy caramel shards. It’s a perfect combination of flavors and textures. 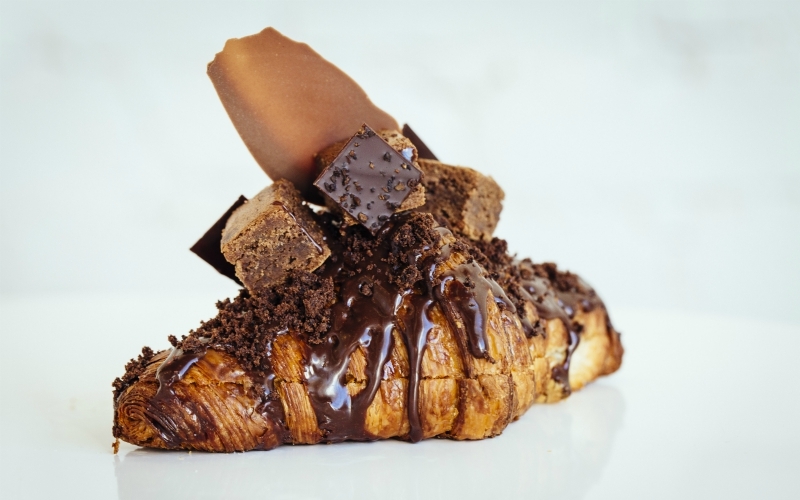 The Coffee Stout Croissant is a masterpiece of a pastry. It’s made with brown sugar cake and stout beer cream, brushed with coffee syrup, and topped with a chocolate glaze, chocolate coffee crumbs, and three mini dark chocolate brownies. It’s a little overindulgent, but that’s what we love about it. The rich, dark flavors are decadent and glorious. Ed. note: All pastries were provided free of charge, courtesy of Mr. Holmes Bakehouse.